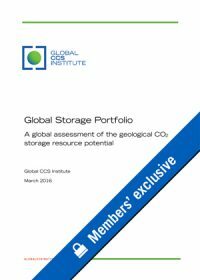 Christopher Consoli, Institute Senior Adviser for Storage, Asia-Pacific provides an overview of this report in an Insight available on the Global CCS Institute website. Substantial storage resources are present in most key regions of the world. Reliable methodologies to determine and classify regional storage resources are available and have been widely applied, although there is no formally recognised international standard. The level of resource assessment undertaken and the availability of characterisation data is highly variable across regions. The level of detail a regional resource assessment has progressed as well as the policy, legal and regulatory frameworks are key criteria that can be used to gauge the readiness of any given nation to deploy a CCS project. ​The resulting portfolio will enable the reader to rapidly establish a snapshot of a country’s storage resource and potential to deploy a large-scale project. The Hazelwood Carbon Capture and Utilisation Pilot Project enabled one of the largest post-combustion carbon capture plants to be installed on a coal-fired power station in Australia. While it is only a pilot scale demonstration plant, this project has strategic significance to the development of carbon capture and storage (CCS) in Australia. Valuable experiences have been achieved through ‘learning by doing’, including funding, management, training, equipment, operation etc. The report endeavours to share those experiences and knowledge. Knowledge sharing is a key objective of the Global Carbon Capture and Storage Institute (the Institute). A key goal of the Institute is to work with industry partners to share knowledge acquired in the implementation of CCS projects. 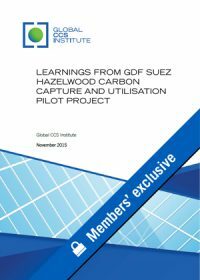 This report is a collaboration between GDF SUEZ Australian Energy, the operator of the Hazelwood Power Station, and the Institute. Lorraine Mitchelmore's article, Why CCS is Essential for a Low-Carbon Future, is part of an opinion leader’s article series for Focus on CCS. The series features contributions from world leading authorities on carbon capture and storage (CCS), presenting their perspectives on the role for the technology in reducing our carbon dioxide emissions. 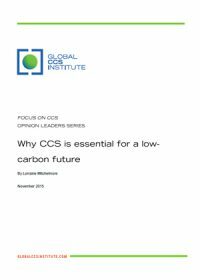 The series is published by the Global CCS Institute to contribute to the conversation about CCS within the portfolio of options to help tackle climate change. Lorraine Mitchelmore is President and Canada Country Chair of Shell Canada Limited, Executive Vice President Heavy Oil for Upstream Americas. 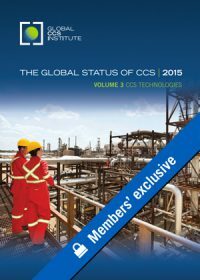 In Volume 3: CCS Technologies we explore all elements of the CCS technology chain (capture, transport and storage), focusing on opportunities for cost reduction in carbon capture, and CO2 storage resource assessments. This volume will be of greatest value to those interested in research and development trends in CO2 capture, transportation and storage. 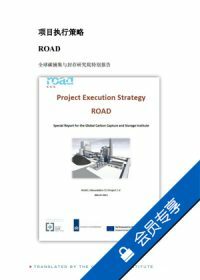 Chinese translation of Applying carbon capture and storage to a Chinese steel plant. This publication describes Total’s Lacq CCS pilot demonstration project. The pilot project entailed the conversion of an existing air-fired boiler to a 30 MWth oxy-combustion boiler that produced a flue gas with a high CO2 content. 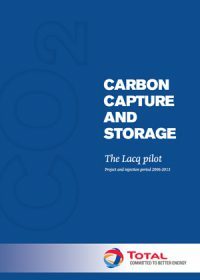 The project’s aim was to test the complete chain of capture, transport and storage of purified and compressed CO2, integrated within the infrastructure of the Lacq industrial platform. The publication includes technical and geological content, environmental impact and risk assessments, monitoring and surveillance data, and a discussion on community outreach. It provides insights for those involved in developing CCS in the future. 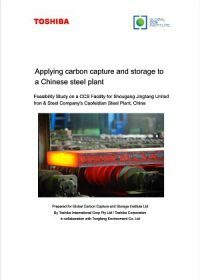 The Global CCS Institute presents a feasibility study report on applying carbon capture and storage (CCS) to a steel plant in China. Toshiba was commissioned to conduct the study through its business partner Tongfang Environment in collaboration with Shougang Jingtang United Iron & Steel of China. 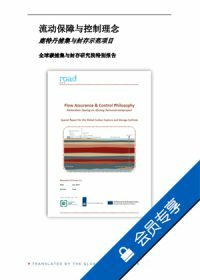 The study examined the application of CCS onto the Caofeidian steel plant. The report covers the concept of capturing CO2 from a Chinese steel plant, transportation and potential storage in an oilfield for enhanced oil recovery (EOR). The study suggests that carbon capture in Chinese steel plants is a cost effective means of reducing carbon emissions compared with similar plants around the world. 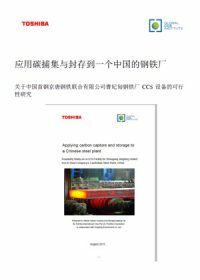 This report is authored by Toshiba for the Global CCS Institute. 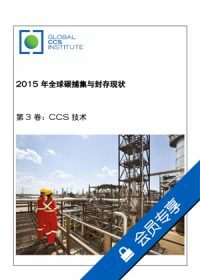 Tony Zhang, Institute Senior Adviser for Carbon Capture, Asia-Pacific also provides an overview of the report in a new Insight available on the Global CCS Institute website.